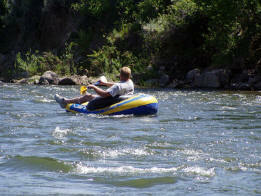 Rafting and floating down the White River from Meeker is very popular during summer months. The White River Valley boasts some of the finest fishing waters in Colorado. Much of the best fishing is on private land, owned by people who invest in their stretch of the river to protect spawning beds and fish habitat. Some of these landowners also pay to stock the river with catchable fish. If you want to fish these protected waters you'll need permission, and you might have to pay something for the privilege. But, there is still good fishing available along the public access areas. Here are those areas, and how to get to them. River Camp RV Park, Campground and Horse Motel Guests can fish the 3/4 mile of the White River surrounding 3 sides of this campground located 2 1/2 miles west of Meeker. The owner says: "Be sure to bring your fishing pole." No live bait, catch & release on the big trout!! You can catch Rainbow Trout, Brown Trout, Native Cutthroat Trout and very large Whitefish right from the property. Visit the River Camp website for more information. 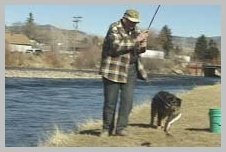 Meeker City Park People catch rainbow, brown and native cutthroat trout, and whitefish right in the Meeker city limits. The river is open to the public from the Circle Park bridge, at 4th and Water streets, downstream to the 10th street bridge. The Green Cabins to the Nelson-Prather Trout Unlimited Access. Head upriver on the Flat Tops Scenic Byway - Rio Blanco County Road 8 - east of Meeker. Set your odometer as soon as you pass the "Begin Scenic Byway" sign shortly after turning only RBC 8 from Colorado 13. At 1.0 miles, you'll see some small green cabins on your right, across the river. Starting at the bridge going to the cabins, you may fish up the river for the next 2.2 miles to the N-P TU Access. Fish only on the side of the river closest to the road. Do not cross the bridge, or fish from the bridge. If you prefer to fish your way downstream, you may drive 2.0 miles farther to the N-P access. There is a small parking lot and a large sign to mark the N-P TU. You may fish down the river to the Green Cabins. Never climb any fences, or cross to the other side of the river. Sleepy Cat Access. When you've driven 14.4 miles, you will encounter the Sleepy Cat ponds. You may fish up the river from the ponds for almost two miles. At the upper end of this public access stretch, a path will lead you to the road. Again, you may drive 16.3 miles, walk the path to the river, and then fish down the river to the Sleepy Cat ponds. Rio Blanco County Access. At 24.0 miles up the river, RBC 8 intersects with RBC 14. Turn right only RBC 14 and drive about a mile to the county campground. The river is open downstream through the county picnic area. Lake Avery. Drive 18.1 miles upriver from the Scenic Byway start sign. Lake Avery will be on your left. If you see the large concrete spillway, you've gone past the Avery turnoff. You can't see the lake itself from the road. Meadow Lake. This mountain lake is accessible from late June until the snow flies. Drive about 18.5 miles to RBC 17 - the Buford New Castle Road - at Buford. If you pass the Buford store, you've gone just a little too far. Follow RBC 17 for 12.1 miles to the Hiner Springs turnoff. Turn left on the Forest Service Road 601, and follow it to the Meadow Lake turnoff. Trappers Lake. Go 38.8 miles up the river to the Trappers Lake Road. Turn right, and drive until you reach Trappers Lake. You'll know it when you see it! Note: the road dead ends at the campgrounds just beyond Trappers Lake Lodge. Vaughn Lake. Just 53 miles up the river from the Scenic Byway entry sign, you'll find Vaughn Lake. NOTE: There are many expert anglers in eastern Rio Blanco County, and they've figured out what works best for every stretch of the river and all the lakes, and for each time of year. Your best bet is to ask the resident experts who sell fishing supplies for advice on what's working on the river and at the lakes. 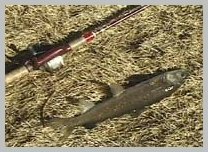 Generally, for fly fishing enthusiasts, dark and light elk hair caddis, Renegade, black gnat, muskrat and Trapper Lake Special tend to work almost all the time.